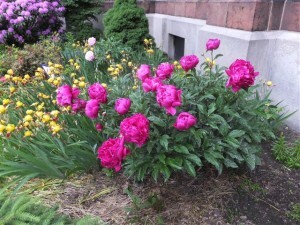 Join volunteers from Buffalo Underground at our Garden Work Party on Tuesday, June 16, at 6:30 p.m.
Monday, June 15 ~ Communion Service at 11:00 a.m.
Garden Party “Reblooms” ~ Parishioners who have questioned what happened to our annual spring garden party will be happy to learn that it’s back, beginning on Tuesday, June 16, at 6:30 p.m. We already have a core group of volunteers, thanks to Buffalo-Underground. After touring our church on May 31, they asked what they could do to help us, and gardening was the answer. We are now looking for parish volunteers to welcome and work along with them. Even if you can only spare an hour, please stop by with your garden gloves, kneeling pad and favorite weeding tools. 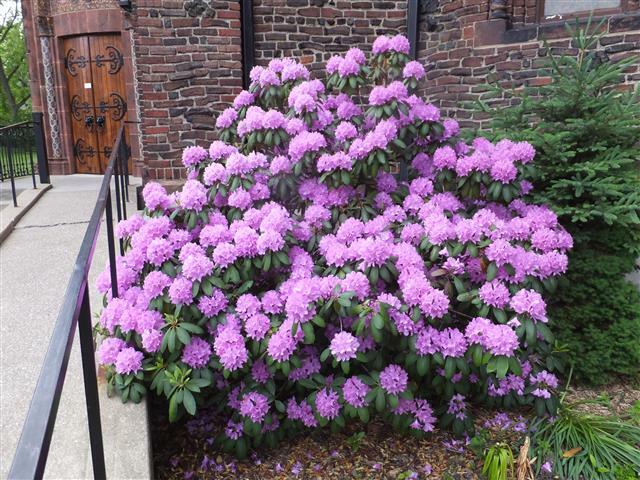 Although our east side garden is currently ablaze with rhododendrons, iris and peonies, much remains to be done on the west side of the church and rectory and on the Dewey Avenue side of St. Charles Hall. We need you on Tuesday evening, June 16. If weather causes a cancellation, it will be noted on the Home Page of this web site and on our Facebook page. Parish Council ~ There is an important meeting of the Parish Council on Wednesday, June 17, at 7 p.m. in St. Charles Hall. If you are a member of the Council, please make every effort to attend. Bishop Malone has written a letter to area Catholics about the importance of the Education Tax Credit (“ETC”) legislation now before Members of the State Assembly for a vote. Time is of the essence as the current legislative term ends June 17. To read the complete text of his letter and learn why you should encourage passage, Click HERE. Preservation Project Begins ~ Earlier this year, Blessed Trinity Catholic Church received word from the New York State Office of Parks, Recreation and Historic Preservation that our application for funding to repair and restore major sections of our landmark church had been approved. With God’s help, we now begin the process of making these improvements happen to meet State and Federal standards. Blessed Trinity is currently accepting proposals for architectural design services in connection with restoring our roof, nave windows and front entrance steps. Architects wishing to submit proposals must demonstrate education, experience and expertise in historic preservation and the development of Sectarian Budgets. Responses must also include assurance of significant (30%) contracting opportunities for minority-and woman-owned business enterprises. For a copy of the Request for Proposals (RFP), call 716-833-0301 or email us at blessedtrinity [dot] bflo [at] yahoo [dot] com. Proposals must be submitted to the Church by 4:00 p.m. on Monday, June 22, 2015. An Evening Farmer’s Market Comes to Leroy Avenue ~ Every Wednesday evening, from 4-6 p.m., now through October 22nd, the Massachusetts Avenue Project’s Mobile Market will be coming to the FLARE! Rain or shine, you’ll find “a farmers market on wheels” in the driveway next to FLARE. On Thursday evenings, from 4-6 p.m., it will be at nearby Elim Christian Fellowship, 70 Chalmers Avenue. Take advantage of this twice a week opportunity to shop for fresh produce from local growers right in your neighborhood! For more information, Click HERE. Bishops Seek Assistance in Renewing Western New York ~ In January 2015, Bishops Richard J. Malone of the Roman Catholic Diocese of Buffalo and R. William Franklin of the Episcopal Diocese of Western New York issued their first joint pastoral letter on the Renewal of Western New York. In a follow-up letter dated June 14, 2015, the two prelates express gratitude for the positive response to their joint statement and offer “concrete suggestions” to those who have asked what can be done “to move our region toward inclusivity and equality.” To read an excerpt from their second letter, Click HERE. 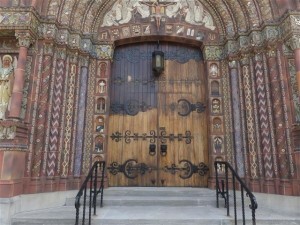 Restoration of Church Doors ~ The front doors of the church are currently undergoing restoration by Bryans Brothers Painting, the same local artisans who restored the east side door last fall. The Marriage Counseling Center of Catholic Charities offers services at two locations, in Amherst and West Seneca, and is a unique resource in Western New York. It has been dedicated to counseling couples for more than 50 years. Services are provided by master degree level therapists who specialize in couples’ treatment, pre-marital counseling and individual counseling for relationship problems. Last year the center assisted more than 4,000 people! To refer a couple, simply give the interested party our phone number, 716-839-4406, and have them call our office weekdays between 5:45 a.m. and 4:45 p.m. Find Catholic Charities at http://www.ccwny.org. Summer Respite For Single Moms ~ Thursday, July 30 to Saturday, August 1 at the Center of Renewal on Stella Niagara Campus, Lewiston, NY. See flyer at church entrances. Application forms are available through Sister Barbara. For more information: 716-893-0931 or www.womensrespite.wordpress.com. Application deadline is July 15. Family Promise (formerly Interfaith Hospitality) ~ On Saturday, May 30, our Family Promise volunteer team assisted volunteers at Ss. Columba-Brigid Church by preparing and sharing dinner with a group of 14 adults and children who are guests of local religious congregations during their period of temporary homelessness. If you would like to assist at the Columba-Brigid site in the coming months, please Click HERE and leave your contact information. Our parish coordinator, Naoma Allen, or someone on her team will be in touch. Summertime Fun ~ We have copies of the Special Summer 2015 section of DISCOVER, published by The Buffalo News. It contains just about everything that will be going on in and around Buffalo during the summer. They are near the Ushers’ Pew in the middle of church. Feel free to take one, make your plans and enjoy! 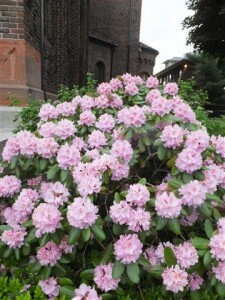 Rhododendron in west side garden. Employment Opportunity ~ A part-time maintenance position has become available at St. Martin de Porres. Duties include performance of manual work necessary to maintain cleanliness, orderliness, appearance of the interior of the Church building and sanitation of church grounds, roads, and walkways. Work is performed within established procedures under both written and verbal instructions. Some minor decision making about details of work is exercised. Compensation is dependent upon experience. To apply, please contact the parish for an application and position description at: stmartindeporresbuffalo [at] gmail [dot] com or call 716-883-7729. Completed application forms may be submitted until June 30, 2015. No walk-ins please. NativityMiguel Middle School offers a Catholic school education on single gender campuses to students in grades 5th through 8th. We are currently scheduling interviews for next year for girls entering 5th to 8th grade and for boys entering 5th through 7th grades. For girls, please call Mrs. Marilyn Solomon-Ward at our St. Monica Campus (852-6854). For boys, please call Father Edward Durkin, S.J. at our St. Augustine Campus (836-5188 ). Copies of our brochures are available on our website at nativitymiguelbuffalo.org/how-to-apply.html. Thank you!